Hotel Grand Chancellor offers stunning waterfront views overlooking the Hobart Harbour and Constitution Dock. HGC is just a short walk away from popular attractions such as Salamanca Place, the Markets, Battery Point, the MONA Ferry and the CBD. HGC is one of Hobart’s largest hotels and is the perfect place to sit back, relax and take in the delights of Australia’s second oldest city. Meet for drinks in The Atrium Bar or reserve a table at the fashionable Restaurant Tasman and enjoy Tasmania's finest regional ingredients and superb harbour views. 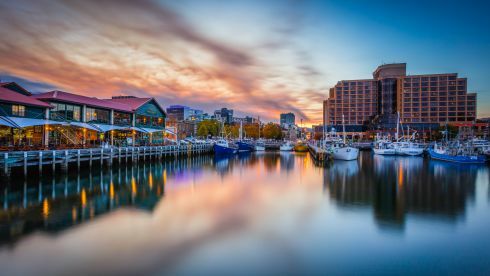 April in Hobart is Autumn and delegates can expect temperatures between 8 – 17 degrees Celsius. Tasmania operates on Australian Eastern Standard Time (AEST) which is UTC/GMT+10/11 depending on the time of year, due to it observing daylight saving time. Tasmania will move to UTC/GMT+10 on Sunday 5 April 2020, the morning of the pre-conference workshops - make sure you change your clock so you don't arrive an hour early!